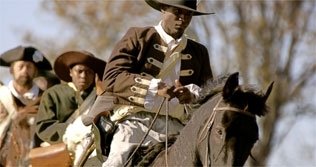 Colonel Tye was an escaped slave who fought with the British in the American Revolution. Challenging Patriot forces primarily in New York and New Jersey, Tye became one of the most respected leaders of the Loyalist troops during the Revolution, a respected and feared guerrilla commander. Born in 1753 as Titus, ‘Tye’ was one of four slaves owned by Quaker John Corlies from Shrewsbury, Monmouth County, New Jersey. In November 1775, when Titus was 22 years old, Lord John Murray Dunmore, the royal governor of Virginia, issued a proclamation that not only declared martial law, but also offered freedom to those slaves who would join the royal forces. Titus along with 300 other escaped slaves fled to join the British, assuming the adopted name of Tye and joining the Royal Ethiopian Regiment. Here he quickly found respect and saw his first action at the Battle of Monmouth on June 28, 1778, during which he captured a rebel militia captain. Tye soon became notorious for his ruthless guerilla tactics during the war. His small mixed race band of guerillas conducted raids and assassinations across New Jersey, often targeting their former masters in search of revenge. In the summer of 1779, they conducted several raids on Shrewsbury in which they attacked and plundered patriot homes, taking clothing, furniture, horses, and cattle. The group was often rewarded with five gold guineas by the British. During the winter of 1779, Tye was promoted to commander of a group of twenty-four black Loyalists known as the Black Brigade. Now called Colonel Tye, he led these men on ruthless raids against the patriots. Joined by the British unit, the Queen’s Rangers, they freed many slaves, and helped to protect New York. The twenty four African Americans of the Black Brigade were also involved in raids on rebel sympathizers during that winter. In 1780, Colonel Tye, led a serious of three actions again into Monmouth County. His raids continuing throughout the summer were aimed at demoralizing the rebels and depriving them of arms and manpower to resist the British. Tye’s tactics were so effective that most of the raids were successfully completed without the loss of any of his men. In September 1780, Tye led another attack on the prominent local county rebel leader, Captain Josiah Huddy. During the short siege, Tye received a musket wound in the wrist, leading to death due to the onset of tetanus and lockjaw. Jonathan Sutherland, African Americans at War: an Encyclopedia (ABC-CLIO, 2004); History 571: Colonial and Revolutionary America, Lord Dunmore and the Ethiopian Regiment, http://www.studythepast.com/history571/pam/ColonelTye.html; PBS.org Africans in America, Part 2: Revolutions, Colonel Tye http://www.pbs.org/wgbh/aia/part2/2p52.html.